This week LibraryWeb will move to a new web content management system, CQ. We are in the process of testing the Libraries’ website on its new platform and plan to "go live" Friday, 11 March 2011. We’re very excited about the new platform and the new domain. One of the most obvious changes that you will notice are the new URLs! 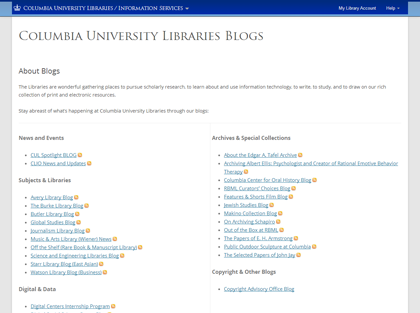 The libraries web address will now be: http://library.columbia.edu/. For library staff that answer questions via channels such as VRef, CUL-Suggestions, etc., please be aware of the URLs you send. If you have "canned" responses, please check them carefully! Should I change my resolver URL (example: http://www.columbia.edu/cgi-bin/cul/resolve?AMS3996) or mnemonic URL (example: http://www.columbia.edu/library/archival) links? No. Resolver URLs and mnemonic URLs will not need to be changed. For mnemonic URLs, you may wish to use the even-more-friendly new URL. What if I come across an old link? How do I fix it? We’re hoping that this won’t happen very often. We are redirecting traffic from the old site to the new in the hope that we won’t have broken links. Inevitably, though, there may be a few that slip through the cracks. Please send along links that you find pointing to our old site to cul-wcm@columbia.edu. When I do a Google search for a page, the old URL is returned. How do I fix this? The best way to update search engines such as Google is through the redirects mentioned above. You may see our old URLs in search engines for a short time, but they should gradually be replaced by our new URLs. I use SWIFT (or BTS) primarily — what should I do? Absolutely nothing — for now! We’ll be migrating SWIFT and BTS content soon, and our URLs will change at that point. For now, however, there will be no changes to either site. Will the URL for CLIO change? No, the URL for CLIO will remain the same. This entry was posted in News and Updates, Transition to New Web CMS on March 7, 2011 by Candice.